I originally wrote “Made in Occupied Japan,” a review of John Dower’s Embracing Defeat, the definitive history of Occupied Japan, for the October 1999 issue of Inside/Outside Japan, the internal newsletter of New York JETRO, the Japan External Trade and Research Organization, a division of the Japanese Ministry of International Trade and Industry. I was asked to do so by Hiroaki Sato, a well-known Japanese poetry translator, literary scholar, newspaper columnist, and author, who works for JETRO and whom I’ve known since 1995. Hiro asked me to review Embracing Defeat because of my long-standing fascination with Occupied Japan. In 1993, I began work on Black Mist, a screenplay set in Occupied Japan inspired by Seicho Matsumoto’s Niho No Kuroi Kiri [Black Fog Over Japan], a fascinating journalistic history of sinister events in Occupied Japan that pretty certainly were engineered by MacArthur’s GHQ. 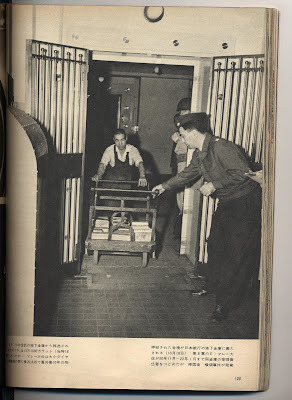 These included in the amazing Bank of Tokyo gold and diamond robbery, the murder of Japan Railways head Sadamori Shimoyama, the runaway commuter train at Mitaka, the notorious Matsukawa train wreck, and the horrifying Teigin Bank poisoning. But in the course of researching Black Mist, I had the occasion to interview at length Elizabeth Gray Vining, Emperor Akihito’s personal English tutor and the inspiration for the Deborah Kerr character in The King and I, in May 1995 four years before her death at age 97, and Faubion Bowers, MacArthur’s aide-de-camp, who literally single-handedly rescued the art form of kabuki theater from extinction at the end of the war. I did exhaustive research to ensure the authenticity of Black Mist and ended up moving to Japan in August 1995 for a year to work as a JET English teacher, and thereby terminate my status as an armchair expert. (I’ve been visiting Japan since 1991.) In August 2003, I spent a week in the village of Matsukawa, the site of Japan’s postwar 9/11, and interviewed many locals who were present at the site of train wreck, including the daughter of the engineer who died in the crash. However, in the course of the writing my review, I fell under the implicit censorship of an overseas entity of the Japanese government. Dower’s central thesis is that Emperor Hirohito knew damn well what he was doing when he led Japan into war, and he was hoping to become undisputed ruler of all of Asia, plus any other real estate that was free to be picked up. Dower makes a compelling case that the reason why many Japanese didn’t embrace guilt after the war was because they figured, well, if MacArthur was willing to let Hirohito the war leader get away scott-free (to serve as a puppet), when everyone knew he was an integral part of the militarist cabal, then why should the average Japanese feel bad about a failed gamble at world conquest? For some strange reason, this was not a point of view that an extension of the Japanese government wanted to have elucidated in its internal house organ, and so Hiro employed his vorpal samurai sword, and several political arms and legs went rolling off into the bushes. Oddly enough, when W.W. Norton published its paperback editon of Embracing Defeat, after Dower went on to win both the Pulitzer Prize and the National Book Award for history, my review was prominently displayed. I was quite amazed when I stumbled across it in Kinokuniya, a major Japanese bookstore in Rockefeller Center—nobody had told me. In the Nineties, I met Dower twice when he lectured at the Japan Society, and I quizzed him some about Matsumoto’s conclusions. 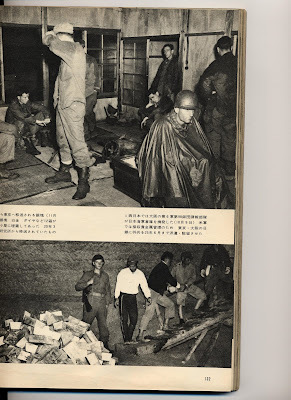 I also showed him some photos I’d uncovered in a Japanese history book of actual photos taken of the 1945 looting of the Bank of Tokyo by Occupation forces—which was akin to finding a candid camera shot of the second gunman at the grassy knoll tucked away in a browning 1964 issue of Life magazine. Dower is a brilliant man and an amazing scholar, but a very important fact is mostly forgotten about him—in the late Sixties and early Seventies, he was a leading member of the Committee of Concerted Asian Scholars, a group of prominent academics who were horrified by the minor fact that America was incinerating three million innocent Indochinese in the Great Indochina War (as it’s properly called). Of course, that exercise in “nation-building” bore absolutely no resemblance at all to the death party the Japanese were throwing in Asia between 1931 and 1945. In Embracing Defeat (W.W. Norton, $29.95), John Dower has written an epic history of postwar Japan under the American Occupation, which lasted from August 1945 to April 1952. 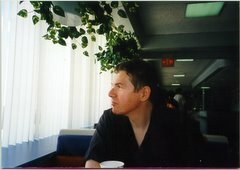 Dower, the Etling E. Morrison Professor of History at the Massachusetts Institute of Technology, is also the author of the masterful War Without Mercy: Race And Power In the Pacific War, which won the 1987 National Book Critics Circle Award, and Japan In War And Peace, a collection of essays. Many books have been written about the American Occupation of Japan, but none come close to Embracing Defeat for a number of reasons. The passage of fifty years has allowed many fresh historical sources to come to light that have overthrown previous assumptions, and the end of the Cold War has made it possible to study Japan's history in broader terms, including the degree to which its destiny was shaped by Cold War priorities. But most of all, no previous writers have matched Dower in his intellectual brilliance, historical scope, and insight into Japan. The depth of his scholarship is apparent on every page, and it is manifest that his research was exhaustive. What set War Without Mercy apart from previous Pacific War histories was Dower's use of popular primary source materials--graphics in particular--that had been largely ignored by historians who focused on "great events done by great men." Dower brings this same technique to Embracing Defeat, which is illustrated both to great effect with photos and graphics of the day (cartoons, posters, and the like) so that the reader can see exactly what he is talking about. Dower also strikingly illustrates his historical points by quoting the letters and personal accounts of the common people who suffered through this terrible period. These vivid words lend the book a humane, immediately accessible quality lacking in previous histories of the Occupation. Who can forget this passage, from a letter printed in the November 7, 1945 edition of the Osaka Asahi Shimbun, entitled, "I Am About to Commit Suicide"? Dower opens the book with an account of the dreadful devastation suffered by Japan in 1945. By its surrender on August 15, 65 of its large cities had been leveled, and its largest, Tokyo, had turned into a vast parking lot. One immediate effect of the calamitous defeat on the Japanese was by kyodatsu--exhaustion and despair--which threatened to unravel the entire society. I have read many histories of the Occupation, but never before have I seen a book go into such heartrending (and fascinating) detail of just how devastated postwar Japan was and how much its people endured. At the time, for political reasons, the severity of the human and material damage was largely suppressed or unreported to the American public; but Dower has dug up the truth and told the compelling story of a nation close to ruin from grinding poverty, homelessness, and despair. 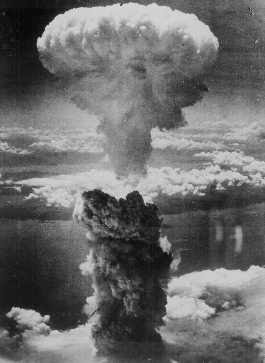 Western observers frequently accuse the Japanese people for their lack of "war responsibility," but after reading Dower, one wonders if the Japanese people, who were forced to consume the poisoned aftermath of the war for seven years, may not be justified in feeling that they had adequately dealt with the war and its outcome. The United States succeeded, in many ways, in bringing democracy to Japan, as Dower shows: civil liberties were introduced for the first time, women were granted legal equality and the right to vote, and a constitution even more democratic than that of the U.S. was implemented, including the famous Article Nine, which forever renounces war as a means for settling international disputes. But Dower shows that although this "revolution from above" was highly successful, it was still imposed from above. This high-handedness on the part of GHQ (General HeadQuarters, shorthand for the Occupation authorities) showed another side in the curtailment of popular demonstrations after May 1946 and the crushing of the proposed general strike of February 1, 1946. 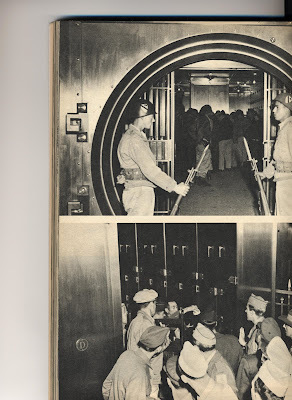 In addition, strict censorship was imposed, reinforcing the Occupation's reputation as a benign military dictatorship. Any criticism of the Occupation or the United States was silenced--hardly the sign of a flourishing democracy--and the atom-bombings of Hiroshima and Nagasaki were considered wholly taboo subjects. This dark side expanded as the Cold War began, and many Japanese came to believe that the U.S.'s mission in Japan was not so much the granting of freedom to the Japanese people as the establishment of a fuchin kubo--an unsinkable aircraft carrier, America's forward military base in Asia in the event of trouble with Russia and China (and later with Korea and Vietnam). 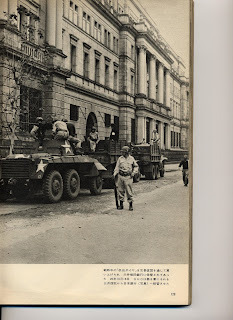 In 1949, the Occupation assumed a conservative "reverse course," known as the Dodge Line, after Joseph Dodge, a conservative Detroit banker, was brought in to bring fiscal solvency to Japan and deal with widespread labor unrest. However, through his stringent budget-cutting, Dodge succeeded in raising unemployment at the cost of curbing inflation, which only produced much more violent labor unrest. Again and again Dower displays his evenhanded approach. No group emerges as a hero or a villain, but largely he sees the history of the Occupation as the jockeying for power on the part of various elites, both American and Japanese. He clears up the mystery, once and for all, about what happened to the untold billions of dollars' worth of war materiel, supplies, and goods that vanished immediately after the surrender; it was stolen by Japanese "men of position and privilege," as Dower calls them, with the help of Japanese authorities. 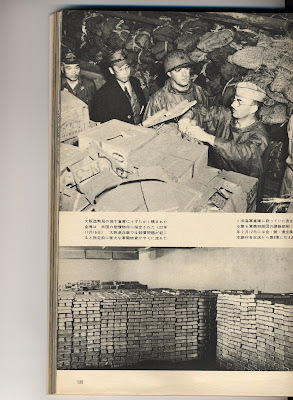 "The diversion of military funds and supplies into private hands actually began the day before the emperor's broadcast [of surrender] and unfolded in several distinct phases… It was later estimated that approximately 70 percent of all army and navy stocks in Japan were disbursed in this first frenzy of looting--and this for a force of some 5 million men at home, over 3 million overseas." [Pp. 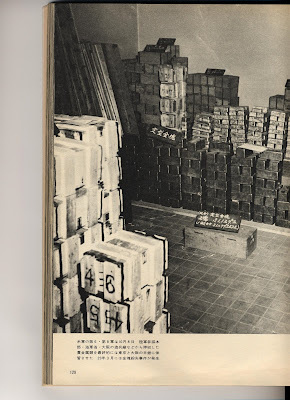 113-4] Dower sees this as an act of economic sabotage; the material went directly into private hands or the black market, further crippling the common Japanese people. Dower argues that many Japanese felt betrayed by the Occupation; instead of replacing or abolishing the prewar elites, it was felt, GHQ kept them in power, and so the feudal basis of Japanese society went untouched. Dower bolsters this argument convincingly and raises compelling questions about America's true aim in the Occupation. While the elites warred for power, the everyday Japanese people struggled and suffered, and in every section of the book, Dower paints the interplay between a nation's private life and public life brilliantly. In addition, he explores how changing times were reflected in all forms of Japanese popular expression, from literature to cinema to child's play (the last of which is often neglected by historians). Dominating the stage of Embracing Defeat are two men: General Douglas MacArthur and Emperor Hirohito. 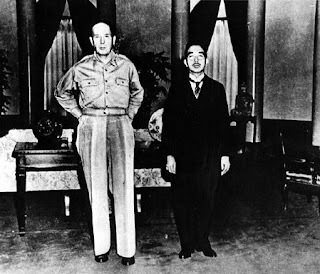 Dower unveils evenhanded portraits of both men, while reporting surprising facts: MacArthur, while ruling Japan like a shogun, never left Tokyo and spoke to only a handful of Japanese in the entire course of the Occupation. Apparently, Hirohito seriously considered abdication on a number of occasions. With great use of colorful detail and a clear writing style, Dower shows how the Occupation paved the road for Japan's subsequent prosperity and reunion with the world's leading nations. No one book can give an omniscient view of what truly went on in the American Occupation of Japan. One of the fascinating things about pursuing the subject that is one finds quickly that each book is part of a larger historical jigsaw puzzle, and each book augments the next, supplying a missing piece of the overall story with new information and insights. John Dower has done what no one else has done, up to now, and that is to deliver a wise, compelling, encyclopedic study of the collision in peacetime between two major players on the world's geopolitical stage: the United States and Japan. This is a book that takes its place instantly on the shelf with such other masterworks on the Occupation as Japan Diary by Mark Gayn, Dilemma in Japan by Andrew Roth, Japan's American Interlude by Kazuo Kawai, and The American Occupation of Japan by Michael Schaller. But Dower has the advantage of historical hindsight and the greater pool of knowledge now available, and he uses them to tell the amazing story of how a nation--whose adventure in Manchuria in 1931 ended in atomic warfare in August 1945--coped with shattering defeat, later becoming the second strongest economy in the world.